I was pleasantly surprised today when my new skillet, the SKT-105-01A , was delivered. My intent is to document its arrival, my opinion of the product, how well it seasons, and how well it cooks. The cost was a bit pricey but it is USA made and I really wanted to check out the smooth interior surface. The outer surface is more rough but still smoother than most cast iron being produced today. The interior appears to be milled smooth on the bottom, sides and upper edge. The exterior bottom appears to have the writing cast or engraved. With the bottom then partially machined, or it is a very smooth casting. The exterior sides and top and bottom of the handle are a fairly smooth cast surface. The cost was $80.00, minus a $12.00 veterans discount, then tacked on shipping of $10 for a total cost delivered of $78.00. The only negative so far is the wait time between ordering, shipping, and delivery. I placed my order on line and it was confirmed 12/13/2017. Delivery was today 1/20/2018. Regarding the lag in shipping. Stargazer was up front when ordering and made it clear delivery would be delayed due to back orders and the Christmas season. They communicated well and advised once shipped, and advised again the day it was out for delivery. 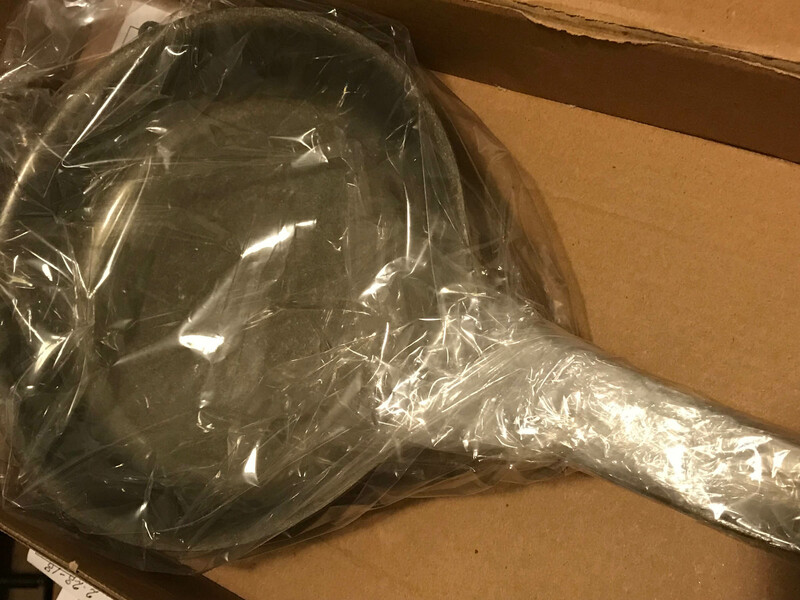 The skillet came packed well and secured well in the shipment box. A lesson some of the eBayer’s selling cast iron need to follow. It would be difficult for it to arrive damaged unless the delivery service miss handled it. In the box it was wrapped and securely taped tight. 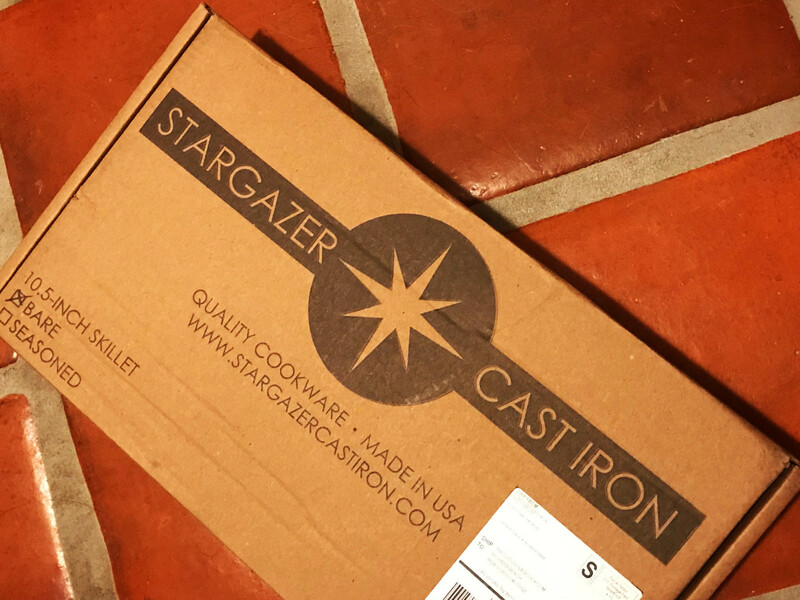 The cast iron had a liberal coating of food grade mineral oil. Following the enclosed directions I scrubbed the piece with soapy water and heated it to dry. A thin layer of seasoning has been applied and the skillet is now in the oven getting its first coating of seasoning baked on. 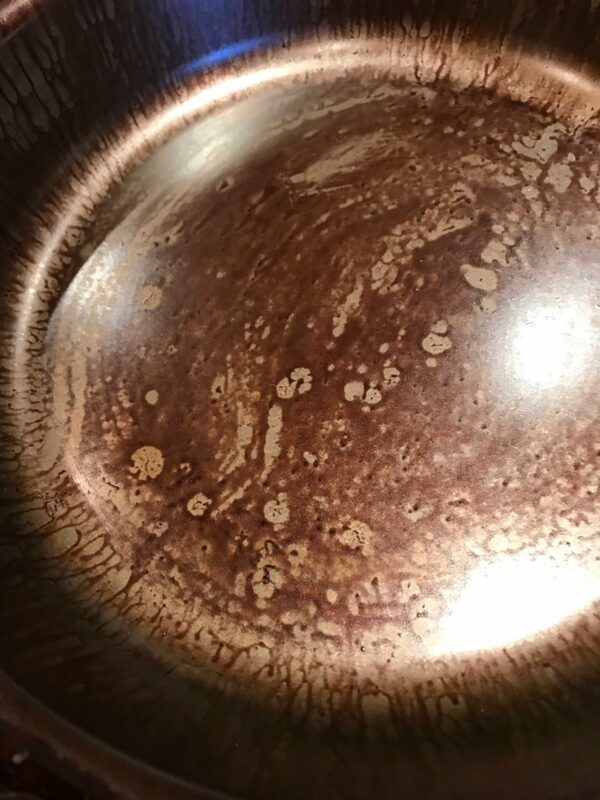 Check back for follow-up on this Stargazer skillet. I have some Crisbee product that I used on a griddle with great results. 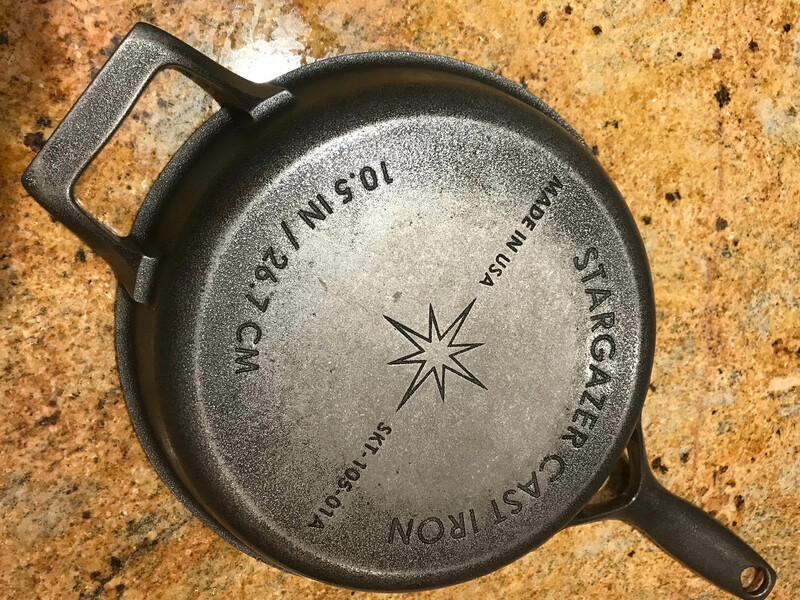 So I thought the seasoning on my Stargazer would be done with Crisbee. Whatever your preferred product, apply it to warm cast iron (not hot). You can do this preheating the oven to 200°. Use a lint free cloth to apply product. Some paper towels are awful for this process. They leave behind fibers. Coat all surfaces very lightly with seasoning product. Wipe away any excess. Place back in the warm (about 200°F) oven. Not in a hot oven. Once the piece is in the oven adjust the temp up to your desired seasoning temperature. Set a timer for your seasoning bake time. I prefer 90 minutes. Once the bake time is over shut the oven off. Do not open the door even to peek. 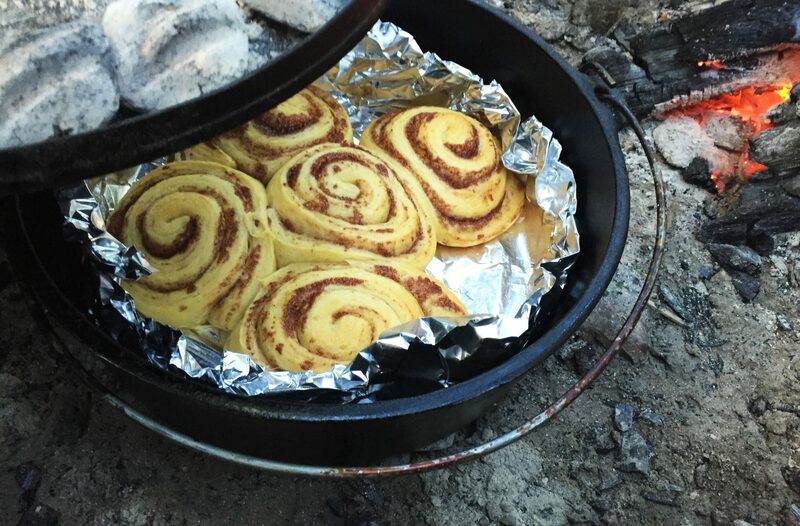 Set your timer for 90 minutes and allow the oven and cast iron inside of it to cool down naturally together. My first coat I was a little disappointed. The surface did not come out uniform. Even though the raw iron, as arrived with a layer of protective mineral oil, was well cleaned with hot soapy water several times. In hindsight I wished I had used #0 steel wool during my soapy hot water cleaning. Mineral oil (which Stargazer’s inserted leaflet indicates) verses a Vegetable oil coating may make a difference? I have even dealt with other cast iron that comes new with a paraffin coating that needed burned off. Doing the initial cleaning, if I was doing it again, I would do two 2 hot soapy scrub baths. Changing the water completely between the two, and using a scrub brush, then #0 Steel wool during the initial cleaning. Something to consider should you be reading this and plan on seasoning something smooth or something with mineral oil on it. I kind of expected it on this smooth surface though. I have had lots of experience seasoning and have seen this happen before. 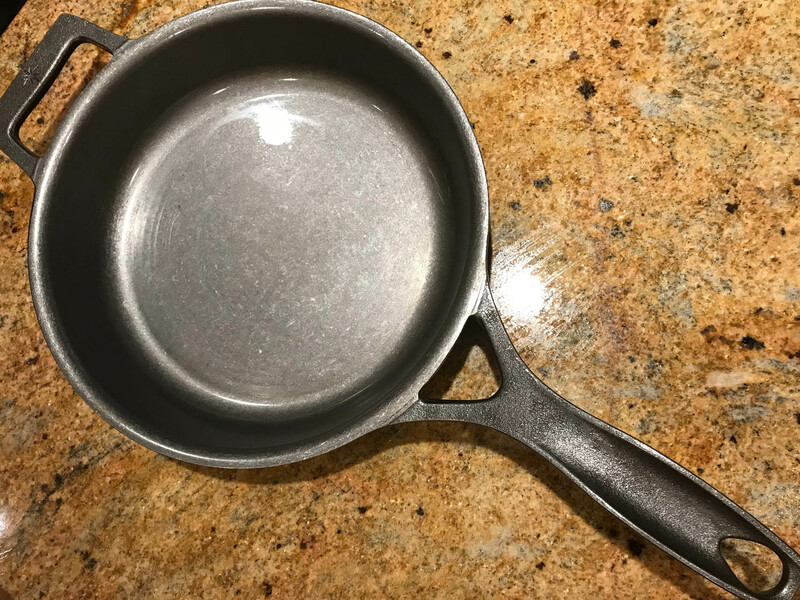 I have noticed this same effect on other vintage cast iron that has a super smooth finish. Regardless of the seasoning product being used. So I am not overly concerned. The brown color on the first coat is normal None of this uneven seasoning can be felt with a finger. My solution from past experiences when dealing with extremely smooth surfaces, is to this is to use #0 steel wool. Worst case scenario might be after evaluating the second coat. I might have to strip this bare again and start over. In hindsight, I am not so sure I did a good job of getting the factory protective coating of mineral oil off? Or if this is a smooth surface issue. I will know soon enough. Stripping it is no big deal if it comes to that. Evaluate your initial seasoned coating. First your initial baked on coat of seasoning should be hard. Not sticky or gummy even to the slightest degree. If this layer of seasoning isn’t hard and firmly adhered you need to go through the baking stage again at perhaps a higher heat, or for a longer period (without applying additional seasoning product). If you start using steel wool lightly and it starts loading up with residue, stop and repeat the bake cycle. That is an indicator of seasoning that has not been heated to the proper heat polymerization point. If you have “pooling” (puddles of concentrated seasoning. These normally are sticky or gummy to some degree, you have applied too much seasoning. I would consider stripping it and starting over. A bad base coat will give you problems. I had no problem with the first coat on this, not being hard and well adhered. On the smooth interior surface I can take the #0 Steelwool and hand/finger buff with almost as much pressure as I can muster, and still not cut through the seasoning unless I stay in one spot for a long time. I concentrate a little more on the spots I call “alligatoring”. Then lightly buff the entire surface to uniformly rough it up. This buffing is nothing you can see. I can not see scratches with my naked eye. This is all done by feel. It provides something for the next coat to grab. While I am at it, I hit the whole exterior surface lightly, just to knock off anything thing there. Lint is the most common thing. The piece is then washed a couple of times in hot soapy water. Rinsed and dried. I immediately place it in a 200°F prewarmed oven for several minutes. When it is warm and completely dry I remove it and spread a very thin layer of seasoning on all surfaces of the skillet. It is put back into the 200°F oven, upside down. I crank my oven temp up to my desired seasoning temperature (This temperature varies product to product, and your actual oven output – read about Polymerization Temperature). I then set my timer for 90 minutes and bake at that temperature. Once the bake cycle is complete I turn the oven off, leave the door shut, and reset the timer for and addition 90 minute natural slow cool down cycle. Once that is complete this seasoning coat should be complete.